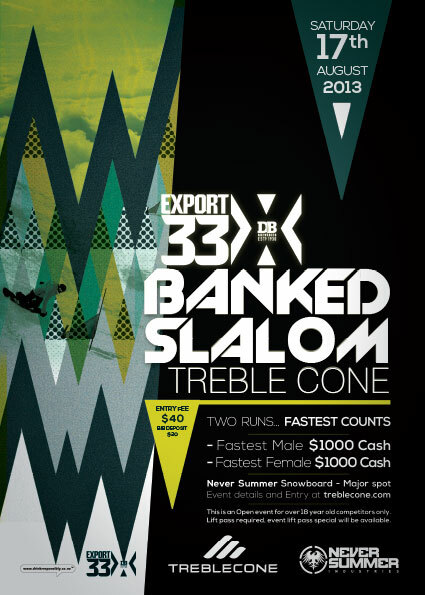 Here is the lastest creation : a poster for the snowboard event held at Treble Cone : The Banked Slalom. Here are a few pictures of my screen taken during the creation process, just to give you an insight of the work behind the poster. It started with the design of diamond shapes in Illustrator CS6, choice of colors and patterns. The pattern has been transfered into Phtooshop to add texture and shadows. Photos have been incorporated in the background of the pattern : a snowboarder and some clouds. It is displayed in Wanaka and around the Treble Cone Base building.